Here is something for all you coffee lovers! Do you rely on coffee to get through your day? Love finding new types of coffee to try? Or are you bored of that standard instant stuff? Well this monthly subscription box from One Click Coffee is perfect for you! I came across One Click Coffee on LinkedIn and as a huge coffee lover I couldn’t help but find out more. The founder Pollyanna and the team are so passionate about One Click and of course about coffee, so couldn’t wait to share it with myself and I couldn’t wait for it to be delivered. I have to say the delivery on this was amazing! It came the day after she had sent it – INCREDIBLE! Firstly, can we all just take a minute to appreciate the packaging! It is so pretty, kind of a vintage feel and super instagramable! I love it! It makes receiving this box even more exciting. A simple brown box with their logo on, and then you open up to their fab newspaper on the top, with the coffee wrapped in a white tissue paper, with One Click printed onto it! It looks like they have put so much time and thought in to every aspect of this box – it is worth every penny. Pollyanna had the idea of the subscription box, after a trip to Copenhagen last year. Every time she goes away, she always brings back a bag or two of coffee and hated the fact she couldn’t easily find different coffees to try when back home in the UK. So created a subscription box for herself and others to discover new amazing coffees. The box is a way of discovering new things, with different coffees each month, either beans or grounded, you can decided on check out. As well as, a newspaper full of tips and information, along with either a snack or something to put your coffee in. Each months box will be different, with new brands every time, plus you will never run out of coffee. Firstly the newspaper is a great addition to this box containing an interview with outpost coffee, an interview with Volcano coffee works and even a page on how to brew with a cafetière. Which was great for someone like me who has never used one! I can’t believe it has taken my 23 years to use one, they are great and make the best cup of coffee. The coffee was also great. My favourite from this box has to be the one from Outpost Coffee. It tastes amazing and tastes even better with some chocolate. If you are a coffee lover and are wanting to try more this year then this box is perfect for you. In 2019 they are bringing you a whole host of roasters ready to go, you’ll never get the same coffee twice, plus they are currently only sticking to filter coffee, as its easier for people to brew at home. Also, if you work in an office, which is full of people who also need a coffee to get through their day, then you are in luck. 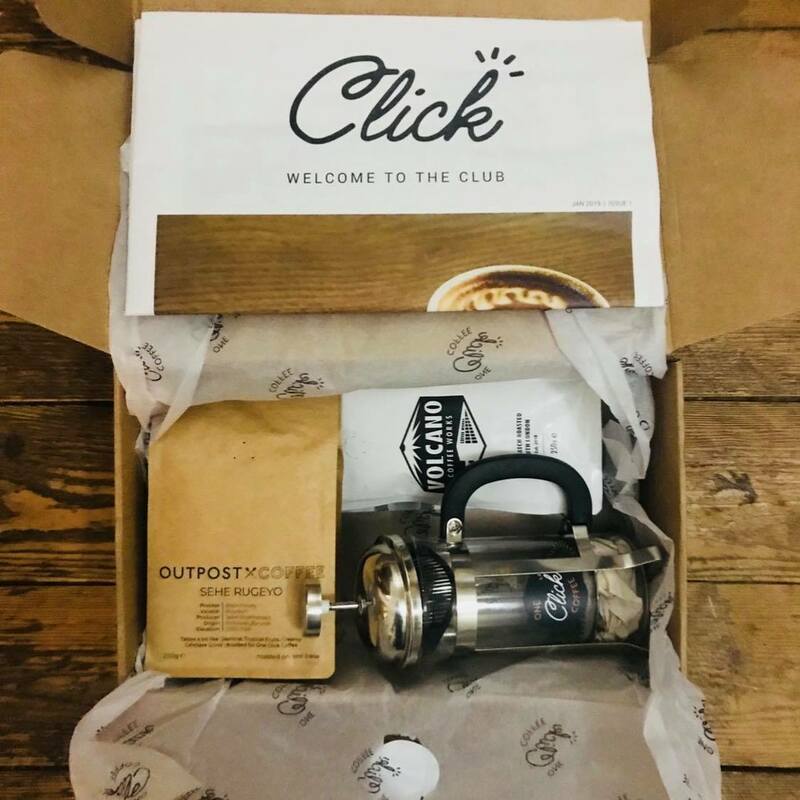 In February, One Click Coffee are launching an office subscription for small-medium size teams who are in need of fresh coffee. This sounds perfect for my office, I have to say! I hope you enjoyed my lovely little review, I can’t wait to share with you guys more exciting food/drink products and also watch out for some more fab restaurant reviews. If you have any recommendations let me know in the comments below.